Do you remember what your bedroom was like growing up? Were you the type of kid whose room was meticulous and neat (like mine) or did you have to wade through piles of clothes and papers just to get to your closet in the morning? Was your room painted a certain color? Did you adorn it with posters? I was never the type of kid who hung a lot of posters on her bedroom wall, but a lot of my friends did. They were posters of boy bands and movie stars and athletes. When I was a kid, it was the golden age of the boy bands so we all would excitedly accompany our very befuddled mothers to the grocery store in order to scamper away and plop on the cold floor of the magazine aisle just so we could page through the seemingly endless colorful photos of Justin Timberlake and Hanson. It was a great time to be alive, quite frankly. As I grew up, I watched more and more television to the point where now – as a 25-year old single adult woman – I actually run an entire blog devoted to television. Who knew! But what I remember pretty clearly about childhood, besides the boy bands and the digital pets and the creepy Furbies was this: I had a lot of TV boyfriends. I mean, I thought I would eventually become the future Mrs. Justin Timberlake so I wasn’t putting too much stock into marrying a fictional character (the delusion was still there, of course), but there were plenty of characters on television who wooed my heart and tried to steal it away from JT. In the spirit of nostalgia, I thought I’d compile a list of some of my television boyfriends across the years, spanning from the glorious days of the 90s and ending in the current era of television. So if you’ll indulge me, let me present to you all of the swoon-worthy guys on television who I had crushes on over the years. … This may be embarrassing. I’m going to try to break this down in chronological order to the best of my ability, so this isn’t an actual ranking, per se, of all of my TV boyfriends. But I just want you to see the progression throughout the years and who knows, maybe you’ll actually relate to some of these! Why he made my list: Steve was a really good guy. Sure, he was a goofball and rambled a lot, but for a stereotypical “jock,” he wasn’t a player and he wasn’t a jerk. Perhaps the only thing stereotypical in that regard was that he always ate a lot whenever he was at the Tanner residence. But as DJ’s boyfriend he was sweet and caring and he loved her family. He was always supportive of her, even when they eventually decided to break up (which is still an episode that makes me cry). And when Steve returns in the series finale to be DJ’s prom date, thanks to Kimmy, I couldn’t have been happier. I would have gladly accepted Steve as MY TV boyfriend, because he seemed like a genuinely good guy. Also, the meta joke in the episode where the Tanner clan goes to Disney World and DJ thinks she sees Steve who is dressed as Aladdin will never fail to make me smile. Why he made my list: Oh, Randy. 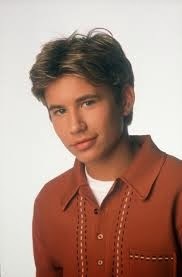 Out of all of the Taylor men on Home Improvement, I really had a thing for Randy. That’s because he was not only adorable but he was also quick-witted and snarky (you’ll soon realize that I have a type). On this sitcom, Randy always managed to hold his own against his father when it came to delivering punchlines and that always made him stand out above Brad and Mark, who were both funny in their own rights – don’t get me wrong – but weren’t as appealing to me. I like guys to be funny and if I’m going to consider you to be my television boyfriend, you need to have a sense of humor and a heart of gold, which Randy always seemed to have on the show. … I’m not picky, I swear. Why he made my list: In case you doubted that I had a thing for snarky, hilarious guys, my TV boyfriend from Boy Meets World wasn’t Cory and it wasn’t Shawn, but it was Eric. Eric was always the crazy, delightful character on the series. He was the one who we all can accurately mimic yelling “FEENY.” But make no mistake about it: even though Eric was a bit sarcastic and could generally be defined as a slacker, he wasn’t uncaring or callous. He was the “cool” brother but he was also a very loving brother, as evidenced in all of the scenes he had with Morgan and their relationship. Basically Eric was amazing and if you don’t think you would date him, you’re probably lying to yourself. Or… you’re a guy who isn’t interested in dating other guys. In which case, you get a pass on agreeing with me. Why he made my list: I was obsessed with anything and everything the Lawrence brothers were in, to be quite frank, and I loved Joey Lawrence the most. So obviously I loved his character on the series Brotherly Love the most. He’s just a really, REALLY good-looking guy who is still good-looking today. So much so that I’ve actually watched episodes of Melissa & Joey because of his face. Lizzie: No, Gordo. I'm the loser. Okay? He likes another girl. She's probably prettier than me, she's probably smarter than me, and she's probably a lot more fun than I am. Lizzie: How do you know? Gordo: Because there’s nobody prettier than you or more fun to be with. I MEAN, COME ON. Everyone wanted to have a guy like that, right? A guy who would be there for us and have inside jokes with us and who we would eventually fall in love with. My favorite episode of the series is “Clue-Less” where Lizzie realizes that Gordo is trying to win at a murder mystery game they’re playing so that he can impress her. At the end of the episode, she pieces that together (actually, it’s Kate who pieces it together FOR Lizzie) and she and Gordo NEARLY kiss (it was agonizing as a teenager to watch that nearly happen), making Lizzie wonder if there is a possibility for a relationship with him. Basically Gordo was the perfect guy: he would begrudgingly go shopping with you, skip a school dance because you didn’t want to go, and listen to you cry without judgment. We all wanted our own Gordo and with good reason. Why he made my list: Long before Taran Killam was on a grown-up sketch comedy, he was on The Amanda Show (you all remember those days, right?) and was in a DCOM called Stuck in the Suburbs. And I may or may not have had a crush on him back then. I couldn’t help it: he was willing to make a fool out of himself on sketch shows in order to get a laugh. But he was also really attractive because he had a charming smile and a boyish face. And, to be honest, Taran STILL has both of those things and I think he’s absolutely adorable. Why he made my list: Speaking of sketch comedies, I used to be obsessed with All That 2.0 (post-Kenan and Lori Beth, etc.) and one of the cast members was a guy named Jack De Sena whom I found to be absolutely adorable. He was hilarious. He had a precious smile. He had a mop of dark hair. Yup, he was my TV boyfriend for a period of time until I phased out All That and Nickelodeon all together. But man, were those some good years. Why he made my list: Robbie is actually a departure from my “good but snarky guy” type. He was the “bad boy” for a little while on 7th Heaven and before Kevin (the dreamy Geoff Stults) came along, I shipped him with Lucy. There was something so alluring about a guy who was bad but not REALLY that bad. Again, I have a weird thing for guys with a sense of humor and a heart of gold. Robbie was only on the show for a short period of time, but I really loved him while he was on there. And alas, another TV boyfriend bites the dust. 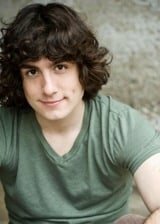 Why he made my list: Look… Phil Diffy was like the next generation’s Gordo (still not as great as Gordo, though) because he was a best friend and adorable and had dark hair and – bonus! – was from the future. He had that very boy-next-door-good-guy thing going for him which is what made him a likable leading character for the series. He messed up, sure, but he always apologized and made amends. And his relationship with best friend and love interest Keely made each of us wish that we had someone like Phil, too, that had our backs and would treat us right. Why he made my list: Besides bringing Jaime and me together, CSI:NY also introduced me to my late 2000s TV boyfriend in the character of Danny Messer. Danny was this tough, snarky, New York cop. And he had this smirk – not the annoying, arrogant smirk that some guys have – but it was this crooked little smirk and when he smiled at Lindsay, you fell a little bit in love with him. Because even though Danny had a tough exterior, he was a genuinely good guy. He cared a lot about the people he worked with; he loved them like he did his own family. And Danny was the kind of character who you could just see yourself being surprised by. I guess that’s why Montana-raised Lindsay Monroe fell for him and I’m pretty sure that’s why the rest of the audience did too. Why he made my list: If Gordo was my ideal as a pre-teen and teenager, then Jim Halpert is my ideal as an adult. What can I possibly say about his character that hasn’t already been said yet? Jim… I think Jim was just portrayed so well on the show. He was this good guy who you wanted to be best friends with because he was just the right amount of goofy and silly to make you feel youthful, but not too much that it made you feel like you would be dating a man-child. He was compassionate and genuine; he was sweet and lovable and made faces at the camera. Jim was the epitome of the good guy trope – he was the kind of person who you just wanted to succeed and get the girl because you felt like he EARNED it. And it’s hard on television when it comes to the relationship between character and audience to make the viewers really yearn for a character to do something or be with someone or succeed at something. But with Jim Halpert… you wanted to be with him. You wanted to be his best friend and you wanted him to look at you the way he looked across the office at Pam. You NEEDED to have that guy as your boyfriend because there was just something so genuine about him that you needed his presence in your life. The Office created a character that women pointed at and said: “Yes, THAT is what I want.” And they did the character justice by making Jim Halpert believable, above all else. Romantic, yes. But believable in his faults and flaws and mistakes and believably human in the pain that is evident on his face in “Casino Night.” He’s a TV boyfriend for the modern era, definitely. 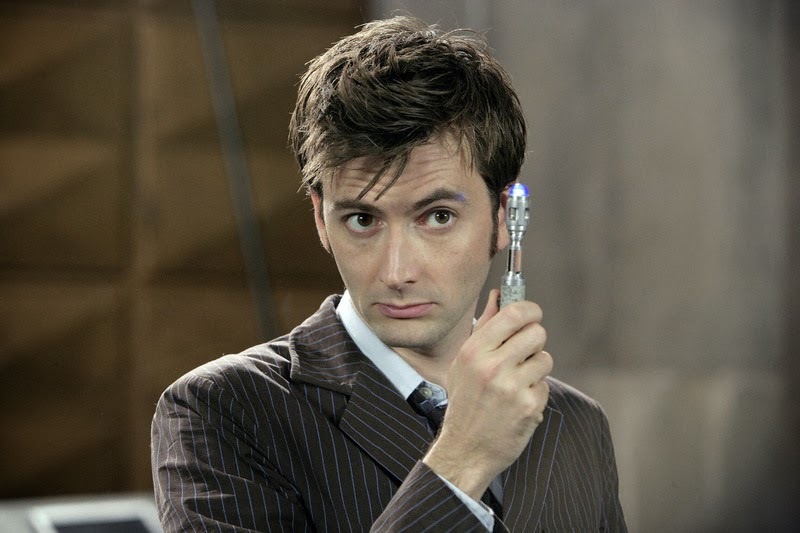 Why he made my list: I’d be straight-up lying to you if I said that I wouldn’t run away with The Doctor. The truth is that if the TARDIS showed up at my doorstep tomorrow, I’d have no qualms with kissing Orlando goodbye and venturing out into the great unknown, traveling all of time and space with this mysterious and attractive man who knows so much about everything and is willing to have adventures. Of course, there’s a very good chance that I’d be quick to die because I’m terribly clumsy and would probably trip and fall and get like, shot by a Dalek or something within the first hour of my adventure. But still, I would travel with The Doctor because I know how much he loves the people he travels with and cherishes them. Oh, sure, Nine and Ten and Eleven were all haunted by their mistakes and by tragedy. That colored all of their lives. But what was always evident was how deeply they LOVED, too. And that is why The Doctor makes the list of my TV boyfriends: because The Doctor is passionate about everything. He’s passionate about life and about traveling and adventure and mystery and fun. He’s not one to sit around and waste precious time. He’s the exact opposite of me which is why I think I’ve always found his incarnations to be endearing and appealing: I’m someone who needs an extravert around in order to get me out of my shell and The Doctor? I think that he would be an extravert. Plus, come on. If YOU had the chance to travel with Ten and his glasses and mussed hair, would you really turn that chance down? Why he made my list: Nick Miller, Nick Miller, from the streets of Chicago can be kind of a man-child sometimes (okay, a lot of the time). He’s the opposite of Jim Halpert in that regard, I suppose, but that doesn’t diminish my love for the curmudgeonly bartender. You see, Nick is passionate and caring and a really good guy. And when he loves someone – like he loves Jessica Day – he puts every bit of himself into expressing that. After watching “Birthday,” how could you NOT want Nick Miller as your TV boyfriend, too? The lengths that he goes to in order to demonstrate how much he cares about the people he loves most is really admirable. Think about “Winston’s Birthday,” where he tries to make Jess a sweet breakfast. Or “First Date” which always pains me because of the episode’s end where you can just FEEL the longing as Nick stands across from Jess in the doorway and says goodnight to her. 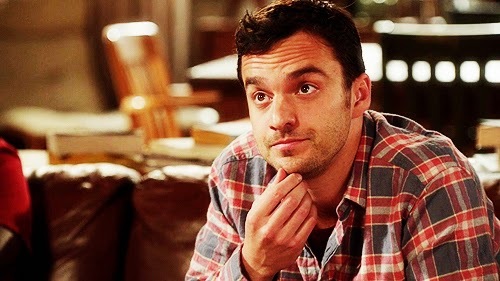 Jake Johnson has taken this character and dimensionalized him with the writers and that, in turn, has changed Nick from a sort of one-off-joke pony (yes, Nick is a bartender in his 30s and is bad at being responsible) to a rounded, passionate, wonderful guy who you just want in your life. Why he made my list: Ben Wyatt is a nerd, he is lovable and adorable, and anyone who says otherwise is both lying to you and also horribly wrong. Ben started Parks and Rec as a kind of judgmental straight-man character. He was the serious, down-to-business guy and while he was cute, there wasn’t much more to him than that. Until he began to warm up to Leslie and Pawnee and we got the chance to see how genuine and passionate and gifted he truly is. Ben Wyatt is one of my most recent additions to the category of TV boyfriends, but that doesn’t negate his significance. Ben is the kind of guy you want: he’s a good guy with a good heart who is nerdy and witty. His glances at the camera rival those of Jim Halpert. But the best part about Ben Wyatt is how supportive he is to his wife, Leslie. Ben isn’t intimidated by Leslie or her success. Where most guys would be worried about keeping up with her, Ben’s main concern is supporting Leslie in making decisions and making her happy. Ben is, of course, successful in his own right but I’ve always admired the fact that he is so calm and collected (minus a few episodes and meltdowns) in the face of Leslie’s hyperenergetic nature. He’s her rock and her support and I think all of us really crave a person like that in our lives. He’s charming and caring; he’s sweet and supportive; he’s witty and wonderful… seriously the only reason you shouldn’t want Ben Wyatt as your TV boyfriend is because you want him as your TV HUSBAND. Why he made my list: The most recent addition to my list of TV boyfriends is The Mindy Project’s own Danny Castellano. Where do I start with Danny, really? He’s basically an old man in personality (but apparently that’s also a theme given that Nick Miller is on my list) because he’s a bit curmudgeonly sometimes. But with that Chris Messina smile and accent, how could you possibly not fall in love with him? One of my favorite tropes in television is the one about a tough, curmudgeonly guy actually being a real sweet, loving person. Danny has had his heart utterly shattered before. And building himself back up caused his heart to grow a bit colder and a bit stonier when it came to love, relationships, and letting others in. Because letting others in allows them the potential to break your heart. Danny is a good guy, even though his actions in recent episodes haven’t always exemplified that. He’s a good guy because he REALIZES he makes mistakes and then makes amends for them the moment he possibly can. Bad guys realize they make mistakes and then continue to live their lives in that realization, not really changing or bettering themselves at all. Bad guys keep breaking hearts because they know they can. And with every mistake they make, their hearts grown bitter and hardened. Danny Castellano is a broken guy, not a bad guy. He’s tender and passionate about his line of work and his patients. He cares deeply about his family. And he loves his friends. He’s kind of a lonely guy, which actually is something that draws women in, I think. It’s not that viewers want to fix him: we just want to get the chance to see him for who he truly is, in those broken and vulnerable moments. Danny is passionate and sometimes the things that come out of his mouth sound like they could come straight out of a romantic comedy. But he’s real and he’s flawed and that – as well as the romantic comedy part – is what lands him on the list of TV boyfriends for me. Past - Jess Mariano,Ryan Atwood,Seth Cohen,Robbie,Kyle Valenti - Spike,Gio from Ugly Betty,Officer Leo D'Amato Red!verse Lincoln Lee and Ryder Lynn. Current - Danny Castellano and Alex Knightley.Also,Annie Edison is my fictional girlfriend because i would totally make an exception for her.